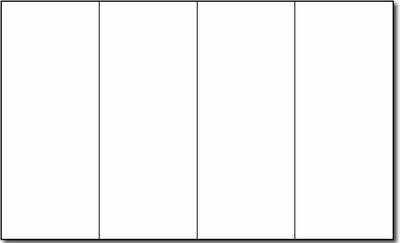 This Blank 4 fold paper measures 8 1/2" x 14" and is created for use in laser or inkjet printers. It is made from a 110lb Index white cover (199 GSM), 8 1/2" x 14" paper. This 4 panel brochure has 4 folds. Each fold measures 8 1/2" x 3 1/2". Scored for easy folding.